A copy of this novel was provided by the author as part of a book tour. M.I.A took a turn from Life, A.D. that I seriously never saw coming. I actually pegged Life, A.D. as sci-fi, but M.I.A was most definitely a paranormal novel. We’re introduced to demons and hell and magic and I was just kind of blown out of the water by the change in content of the novel. But it wasn’t a bad change – just a change. Dez, for me, was still a somewhat unlikeable character. I could understand her anger and outrage in the first novel. I mean, I think any seventeen year old who suddenly finds themselves in limbo is going to be pretty pissed off and angry at the world. But M.I.A is set three months after her death and Dez is still a walking, talking ball of rage and fire. And I’m just a little tired of it. Every person in Atman is dead. Every person in the underage towers got their lives taken away from them way too quickly, and I think Dez needs to hurry up and realise this otherwise she’s going to lose the few friends she’s made in her afterlife. Speaking of her friends. Charlie changed a bit and broke up with Dez early on in the book. I was so surprised by this! I mean, come on boy, if you care about the girl then you obviously have to live with her mood swings and pissiness. They’ve been there all along. Crosby was once again way too forgiving of everything that Dez does (which I think all of the characters in M.I.A were). And Bobby was sweet but then at the end I was kind of disappointed in him for just giving up. The main premise of this novel takes place after Dez and Bobby are attacked by creepy criminals who turn out to be demons. After this, Dez finds out that one of them was trying to “bond” with her. I was slightly confused about this entire thing, if I’m being honest. Why are these demons just allowed to run rampant with damaged souls? What does being “bonded” to one of these douches mean? Why is this guy so obsessed with Dez? Why is this a part of the plot at all? I had a lot of questions about this storyline, because it seemed so far removed from the goings on in Life, A.D, and I think I struggled to bring the themes of the two books together. M.I.A ends on somewhat of a cliffhanger, and I must say that I am interested in where it is going. I think what seems to be the king of hell is going to have a role to play and Dez is in some knee deep shite, and I want to see how she gets out of it. 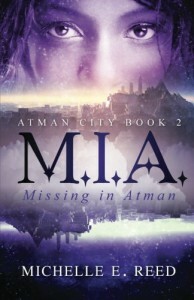 So I will almost definitely read the third book in the Atman City series, even if the plot has taken a turn that I never saw coming (which I suppose keeps the whole thing interesting, right? ).